(Lancaster, Pa., June 16, 2017) - Darian Sandford has come a long way this season. His next step is not a far one, at least geographically. The Atlantic League’s top base stealer’s contract has been purchased by the Washington Nationals, it was announced today. He has been assigned to Class AA Harrisburg, a club managed by ex-Barnstormer Matt LeCroy. The St. Louis native leaves the Barnstormers as the league leader in steals with 33, tied for the Atlantic League lead with 34 runs scored and second in the circuit with a .340 batting average. Sandford, 30, was one of the first players inked to a 2017 Barnstormers contract. The switch hitter was drafted by the Kansas City Royals in 2010 but never played above the Rookie level in their organization. 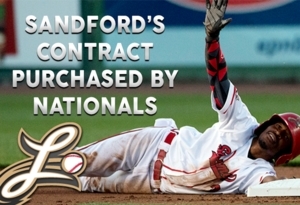 He has played in the CanAm Association, the Pacific Association, the Frontier League and the United League over the past five years before coming to Lancaster this season. He becomes the third Barnstormer to have his contract purchased by a Major League system this year, joining Jeff Kobernus (Seattle) and Elih Villanueva (Boston).